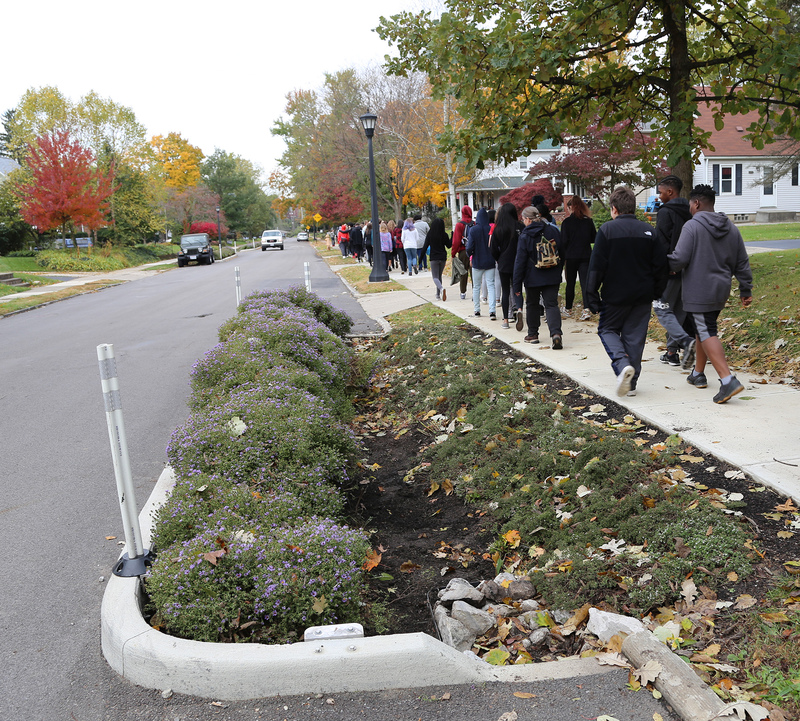 On a sunny October morning in north Columbus a group of Buckeye engineers were surrounded by 56 excited eighth-graders as they measured water outflow in a neighborhood rain garden. Tapping a large storage tank, researchers dumped buckets of water into the rain garden—simulating what would happen during a heavy rainfall. The eighth-graders were tasked with timing both the inflow of the water into the garden and its outflow into a nearby drain. The event was the culmination of a monthlong outreach project focused on eco-friendly stormwater management, a collaboration between an Ohio State team led by Food, Agricultural and Biological Engineering Professor Jay Martin and Indianola Informal K8 science teacher Jared Laughbaum. Funding was provided by a National Science Foundation grant and the city of Columbus. The enthusiasm Lindsay and her classmates showed during the project energized its organizers. In September, Ohio State graduate students visited Laughbaum’s class to introduce green infrastructure concepts, the group’s research and Blueprint Columbus, the city’s plan to use eco-friendly tactics and technologies to mitigate sanitary sewer overflows and improve water quality in rivers and streams. In the weeks following, students researched the problems caused by urban stormwater runoff, sustainable water management practices and more. They brainstormed ideas for promoting rain gardens to skeptics, did experiments to see which mixture of soil, sand and gravel performed best as rain garden media, and worked in groups to present their findings to a panel of experts from Ohio State, the city of Columbus and the community. “It’s good that someone is finally doing something about it,” added fellow group member Ethan. Their teacher said the project spurred students’ interest in STEM and their understanding of how the design process can be used to solve problems. After the experiment, Martin walked the students from the rain garden, along nearby Adena Brook watershed and finally to the Olentangy River, illustrating how stormwater runoff flows from neighborhoods into rivers. 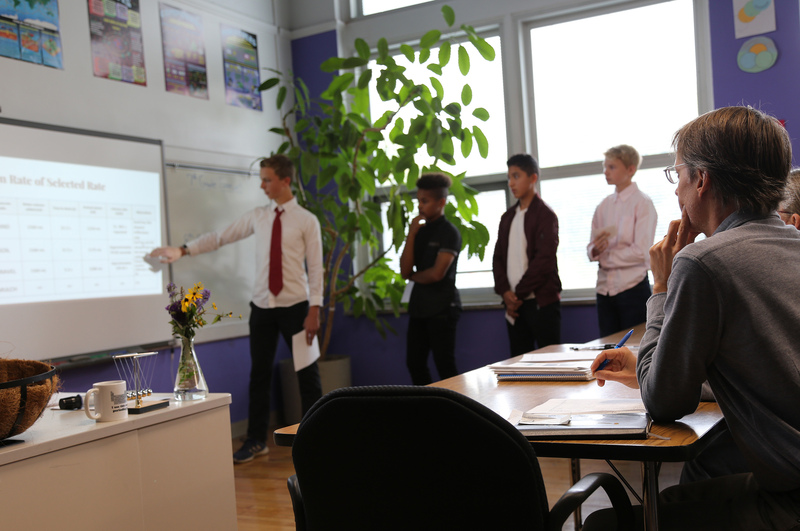 Judging by students’ reactions, the intended lessons certainly hit home. “It’s cool how we were able to be involved in something that’s this big in Columbus,” Ethan said. As an ecological engineer, Martin has been researching water quality issues since the early 1990s. A resident of Clintonville—one of the Columbus neighborhoods where eco-friendly stormwater management techniques are being implemented—he has a personal as well as professional interest in studying its effectiveness. After first hearing about the Blueprint Columbus project, Martin proposed having an interdisciplinary team of Ohio State researchers assess the impacts of green infrastructure on water quality, housing values, community preferences and wildlife habitat. The city agreed, awarding Ohio State a five-year, $1.8 million grant in 2016 to conduct the research. While both traditional methods—known as grey infrastructure—and green practices work, Martin explained, rain gardens and constructed wetlands use naturally occurring processes to clean water and help it infiltrate into the ground water rather than being piped to the nearest river. A team of Ohio State researchers are studying the effectiveness of recently installed rain gardens like this one on a residential street in north Columbus.Martin also leads a two-year, $298,000 National Science Foundation-funded project to study the impacts of ecologically based treatment systems on the microbiome of urban stormwater. Ryan Winston, assistant professor of food, agricultural and biological engineering, and Environmental Health Science Professor Jiyoung Lee are co-investigators. As stormwater moves across the urban landscape and through sewers it can pick up pollutants that can overflow into rivers and impact human health. Potential threats are tracked through E. coli levels, Martin said. But the Ohio State researchers’ preliminary samples showed that high E. coli levels don’t necessarily correlate with the levels of actual pathogens in the water. Just as working with community members of all ages has added new meaning to his water quality research, Martin hopes the project helps his graduate and undergraduate students see the full value of their contributions.